Today at VMworld Europe 2016, vSphere 6.5 is announced. Update: November 15, 2016 vSphere 6.5 is GA.
VMware Update Manager (VUM) for the vCenter Server Appliance (VCSA). VUM is integrated by default in the VCSA and uses the internal embedded database. Enhanced Logging. 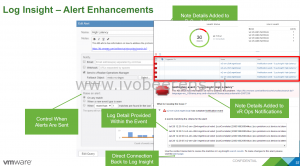 Expose vCenter events to a Syslog server (such as vRealize Log Insight) without turning on verbose logging in vCenter Server and blowing up the database. VM Encryption. Encrypt the VM virtual disk(s) and VM files by using an encryption policy. The VM guest is not modified. The encryption is done at the hypervisor level. Encrypted vMotion. Virtual Machine vMotion data is encrypted during a vMotion on a per VM basis. Secure Boot for ESXi and Virtual Machines. Requires hardware that support EUFI and a secure Boot firmware. Admission Control. Simplified configuration workflow. It automatically calculates the % of resources to reserve. Restart Priorities: Additional restart priorities added such as highest and lowest for more flexibility and greater control. HA Orchestrated Restart. Enforce VM to VM dependency chains. 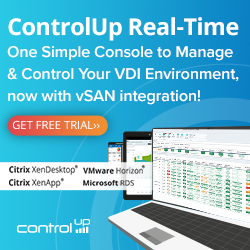 This is great for multi-tier applications the require VMs to restart in a particular order. Proactive HA. 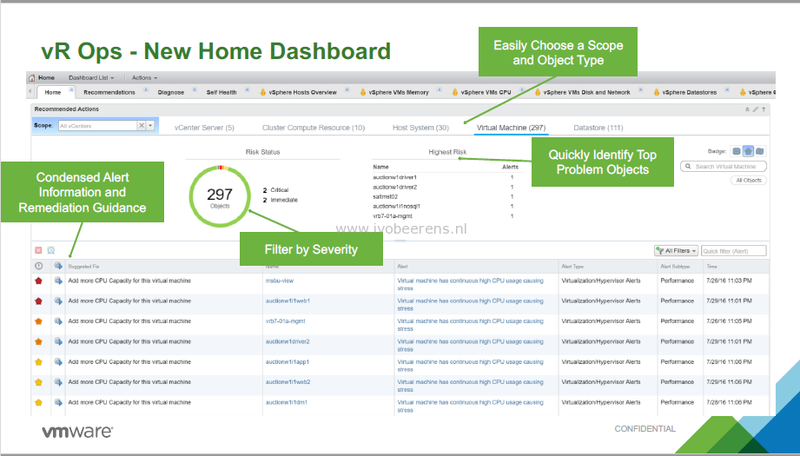 vCenter plugin that connects to the hardware vendor monitoring solution (Dell Open Manage, HP Insight Manager or Cisco UCS). When there is for example a memory failure detected by the hardware vendor monitoring tools, the VMs from that hosts are migrated using vMotion to another hosts. Host level network latency reduction. Allows to run more applications with FT.
Multi-NIC Aggregation. It is possible to pack more NICs like (vMotion for FT) for better performance. Network-Aware DRS. Adds network bandwidth calculations in DRS. This avoids an over-subscribing host network link. Advanced DRS Policies exposed in the UI. 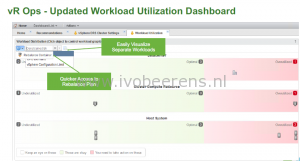 Setting IO limits in Storage Policy Based Management (SPBM) and apply the policy to the VMs. OS Customization during VM deployments from the library. Reducing costs (no need for 10 GbE switches). Separate VSAN data traffic from witness traffic. Virtual SAN iSCSI access. iSCSI access is built for supporting MSCS with shared storage and physical workloads that needs to have storage. 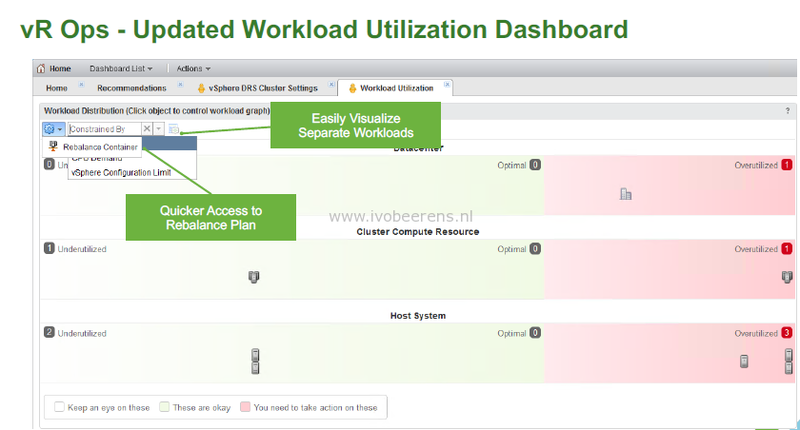 There is no support in this release to targeting the VSAN storage to other ESXi clusters. vSOM is a combines of vSphere Enterprise plus with vRealize Operations Manager standard edition as a single offer. No more snapins are used, it’s now fully module based. Complete new Horizon View module. It is now possible to run from it from anywhere, in earlier releases it was only possible to run it from a Connection Server. On this release are only 2 cmdlets available (Connect and Disconnect). Once connected you can use the API. Microsoft open sourced PowerShell. It possible to run PowerShell from Windows, a MAC and Linux. VMware will release a PowerCLI Core version as fling. Thanks so match for this great article,, appreciated! @ vSAN,, is it possible to use just 2 ESXi server for running vSAN rather than minimum 3 hosts like in previous releases?